At 1406 (2:06 PM) we passed close by Portsmouth Harbor buoy #2, crossing the track that we’d left back on May 30th. This officially completes the Down East Loop! 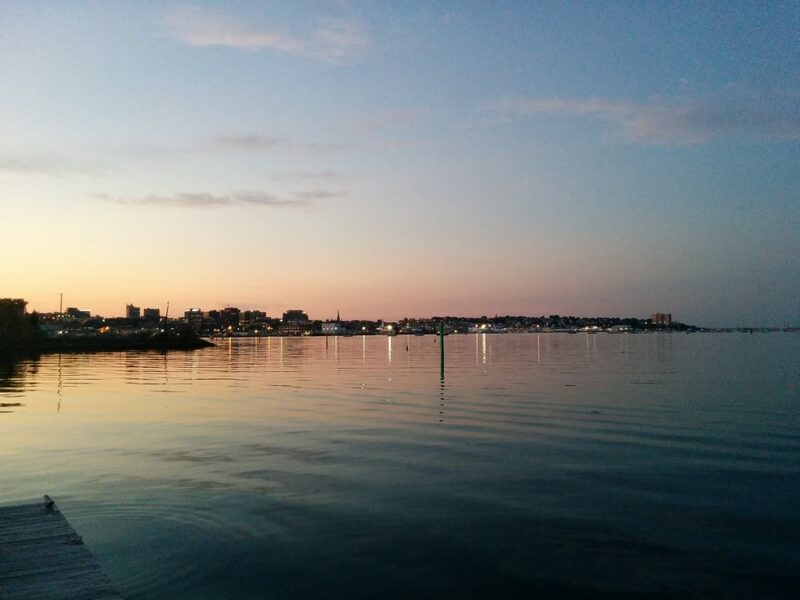 We got to enjoy one last sunset over Portland Harbor last night. 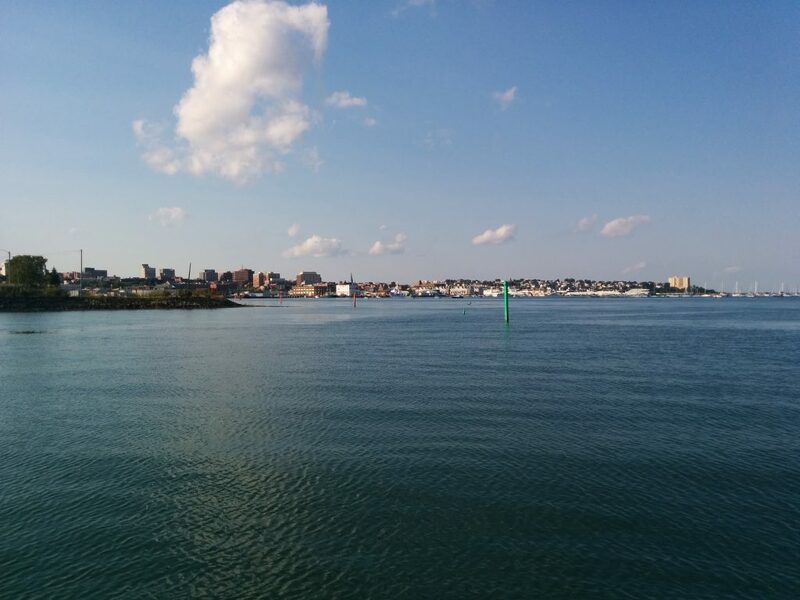 The weather was perfect for the 46-mile transit down to the Piscataqua River. Seas were nearly flat and the wind was light, with just enough breeze for the (real) sailors to set some canvas and provide us with nice scenery as we passed. 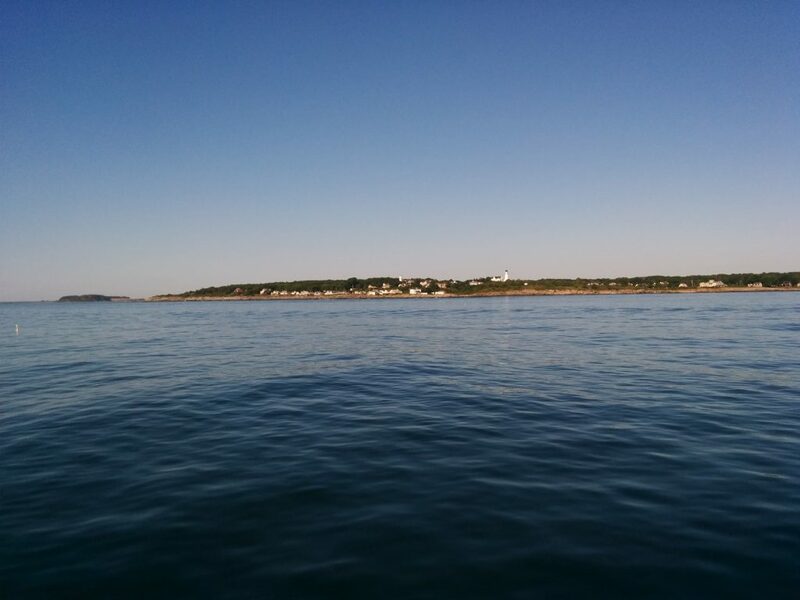 We next passed the Two Lights of Cape Elizabeth, then turned onto a straight course for Portsmouth Harbor. We’ll be on the boat for the rest of the weekend, but as of today our Down East Loop trip is officially done. Posted on August 27, 2016 August 27, 2016 6 Comments on Closing The Loop! 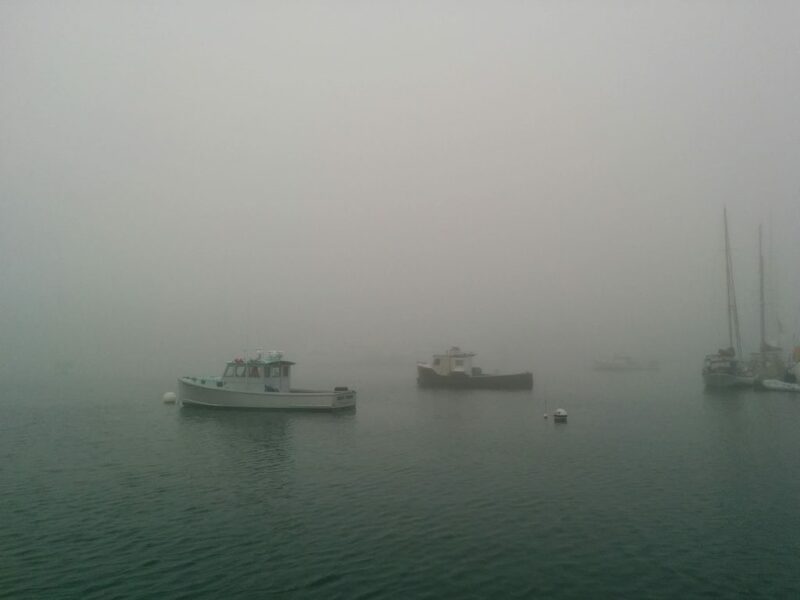 Choosing to believe our eyes instead of the weather forecast, we ended up leaving Boothbay Harbor after all. The sun was shining and the wind had been flat calm much of the night and all morning. Of course, we knew that could change. 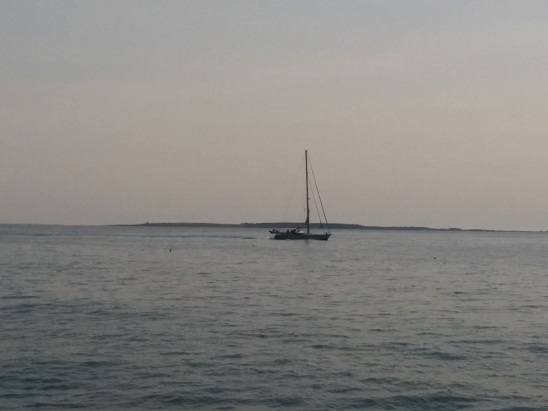 But with only 11 miles of open ocean between Cape Newagen at the tip of Southport Island, and Small Point at the Eastern edge of Casco Bay, and after a calm night, we figured it was worth trying. The gamble paid off. We had a little rain, the winds did eventually pick up, and there were some choppy seas in spots, but nothing we couldn’t handle for a few hours. 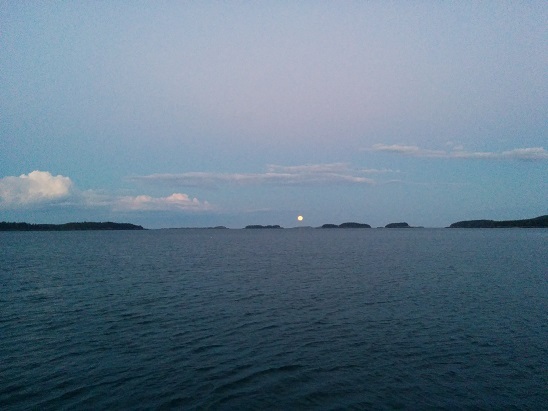 In the end, we didn’t even need to duck behind any of the Calendar Islands in Casco Bay. We set a more direct course for the Fore River between Portland and South Portland, for a total distance today of 34 miles. We called ahead, and were fortunate to be able to reserve one of the last available slips in South Port Marina, on the South Portland side just before the Casco Bay Bridge. This puts us farther from the action in Portland, but this marina is better protected from the incessant wakes around the city waterfront. From this side of the river there’s a nice view of Portland Harbor and the city skyline. At this point the plan is to relax here overnight and get an early start in the morning. With any luck we could close the loop tomorrow! As planned, we’re spending another night in Boothbay Harbor. 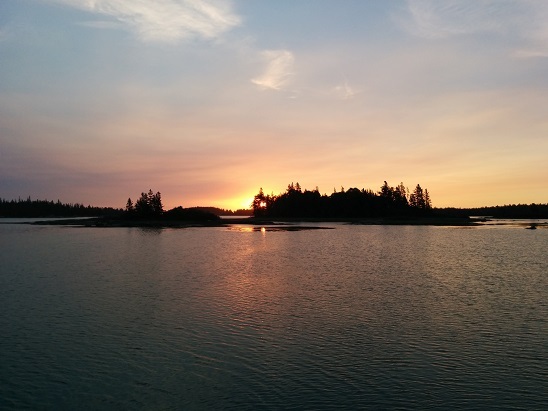 Boothbay was one of our first destinations when we started cruising the Maine coast, and remains a favorite. It has all the generic tourist-trap businesses you’d expect; restaurants, hotels, B&Bs, souvenir shops, harbor cruises, whale watching cruises, kayak rentals, ice cream, jewelry stores, etc. There’s a trolley that runs around the harbor and out to a supermarket. Then there’s the tee shirt outlet. Most of our tee shirts say “Boothbay Harbor” on them. Oddly enough, we don’t visit the tourist destinations back home. We never go to York Beach, Hampton Beach or Old Orchard Beach in the summer. We go out of our way to avoid the traffic on Route One and Route 95 all season. There’s something about being here by boat that makes the difference. No traffic jams. We can walk back “home” to the boat any time. The forecast continues to include strong winds and heavy seas. We have some open water to cross before we reach Casco Bay, so plans at this point are to stay here another night. However, at this writing, there’s not a breath of wind. We’ll see what the day brings! Another early morning. We had 41 miles to go from the Inner Seal Bay anchorage to one of our favorite stops, Boothbay Harbor. 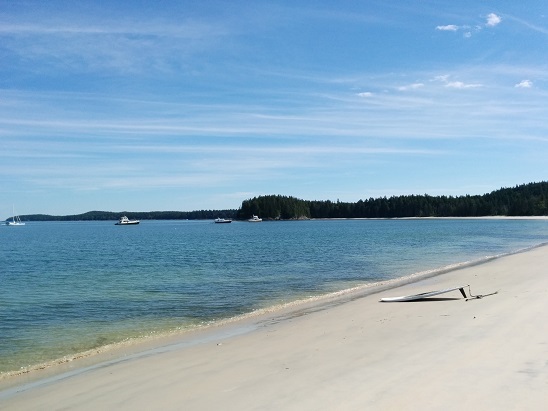 The weather was perfect for running the Fox Islands Thoroughfare between North Haven and Vinylhaven islands, crossing West Penobscot Bay and navigating the Muscle Ridge Channel. 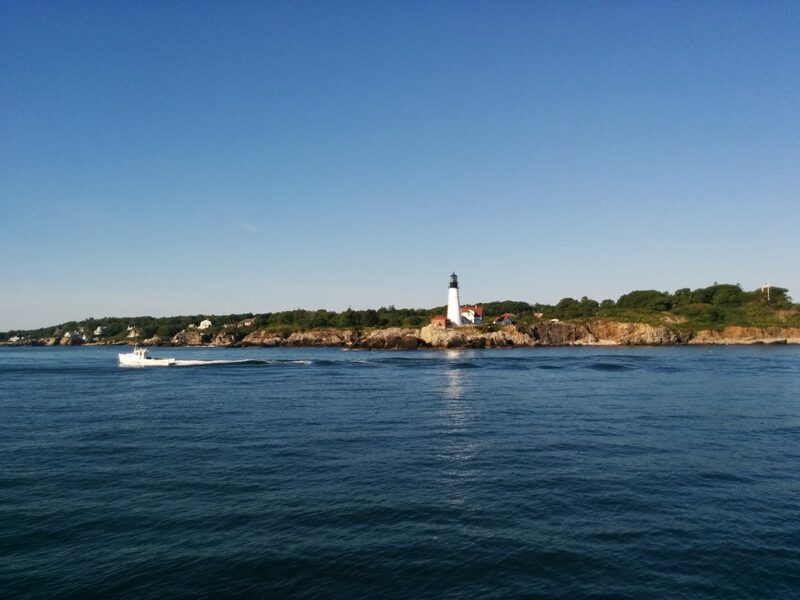 The reason for the early departure became apparent as the wind slowly increased while we transited the open waters around Port Clyde, past Muscongus and Johns Bays and around Pemaquid Point and Linekin Neck. 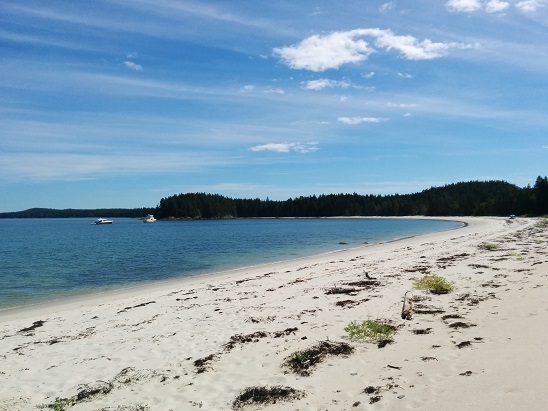 We reached Booth Bay just as noticeable seas were building, and turned in toward Boothbay Harbor. Again, it was nice to see a lot more recreational boats than prior years. But one thing hasn’t changed. Around harbors, there are always plenty of folks out for a day sail. Between harbors, it’s more common to see sailboats with bare masts, motoring. This got me thinking. 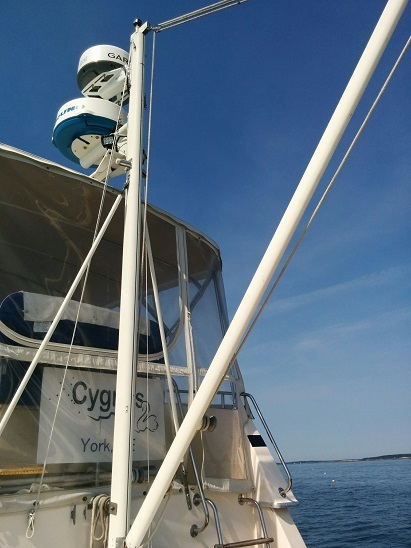 Cygnus has a mast and a boom. In theory, we could set a sail. Instead, we motor everywhere. Just like so many cruising sailboats we see. At dawn, there was no sign of the rain and fog of the past couple of days. We got underway early for the 31 miles to Vinylhaven Island, where there are a number of good anchorages. Taking the inside route, we were in protected waters most of the way, although we did feel the Northwest wind building. This is more of a fall weather pattern, but any breeze off the shore, rather than off the ocean, means a smaller chance of heavy seas when cruising near the coast. Again today, we were struck by how many recreational boats were out and about. There is definitely a big increase over previous years. It looks like the improving economy, and especially the significantly lower fuel prices, have had an effect. We’re staying another night at Northeast Harbor. We don’t usually let a little rain stop us, and fog is pretty routine, but the winds are expected to pick up this afternoon, too. We’re not in a hurry, and the long-range weather forecast suggests tomorrow and Wednesday will be better travel days. That would put us in an area with lots of well-protected harbors for Thursday’s forecast storm. Yesterday we filled up on fuel and water, and moved the boat to a new mooring nearer the marina docks. That’s us near the center of the photo above, behind and well beyond the large yacht. From here we can get a strong marina Wi-Fi signal. However, their connection to the Internet is intermittent at best, so the move really didn’t help us, except to make the launch ride in to shore a little shorter. As predicted, the rain and fog cleared up mid-day, and we took the island bus into Bar Harbor for some obligatory souvenir shopping. Yesterday we enjoyed another great Roque Island sunset. Today we headed for Northeast Harbor, 41 miles away on Mount Desert Island. Through Moosabec Reach, between Jonesport and Beal’s Island, we encountered a 1- to 1.5-knot foul current, and as usual, thousands of lobster buoys. And to think the folks in Shediac Harbor tried to call their town the “Lobster Capital”! Still, the weather was calm and running against the current meant the buoys and toggles were parallel with our direction of travel. Later on, with the wind on our beam and no current, they were all strung across our path. This diagram (from Bucks Harbor Marine) oversimplifies things. Imagine hundreds of these things, and there’s always three or four more strung across where this diagram indicates “pass here.” And don’t believe that bit about the toggle being “2′-10′” from the main buoy. It’s usually 20-50 feet. Only some regions use toggles. Intelligent lobstermen just use one pick-up buoy (“main buoy” in the diagram.) I’ve heard lots of reasons for using toggles. None of them justifiable. In Southern Maine, we have all the same issues; strong currents, large tides, rocky bottoms that snag and chafe lines, etc. But somehow we manage without toggles. Needles to say, Otto is unable to see and avoid these snares, so navigation here is pretty “hands on.” Reading the wind and current, learning what each fisherman’s individual buoys and toggles look like, and how each one is rigged, becomes second nature. And the extra vigilance at the helm pays off when there’s other debris in the water. 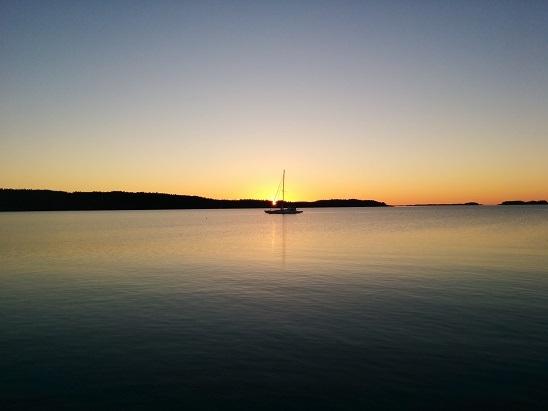 Northeast Harbor is always our preferred destination on Mount Desert Island. 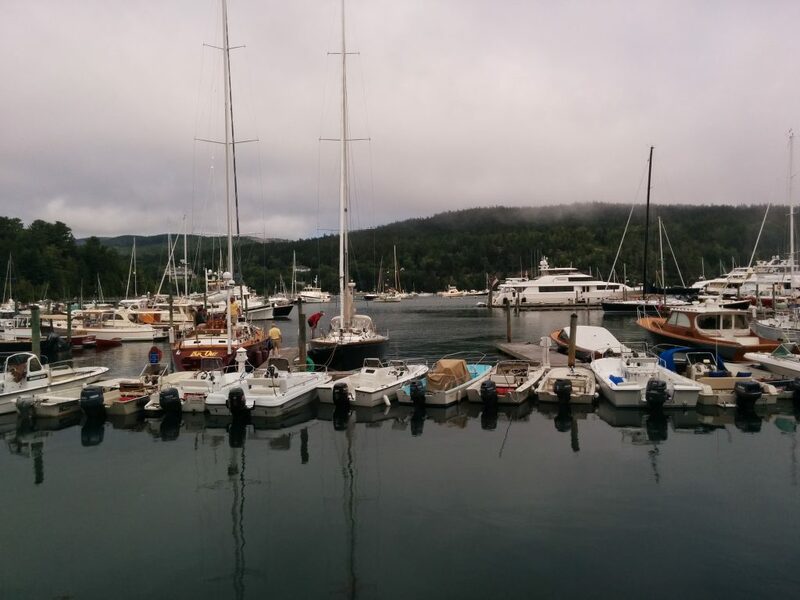 The more well-known Bar Harbor has a small, overpriced marina with few services. 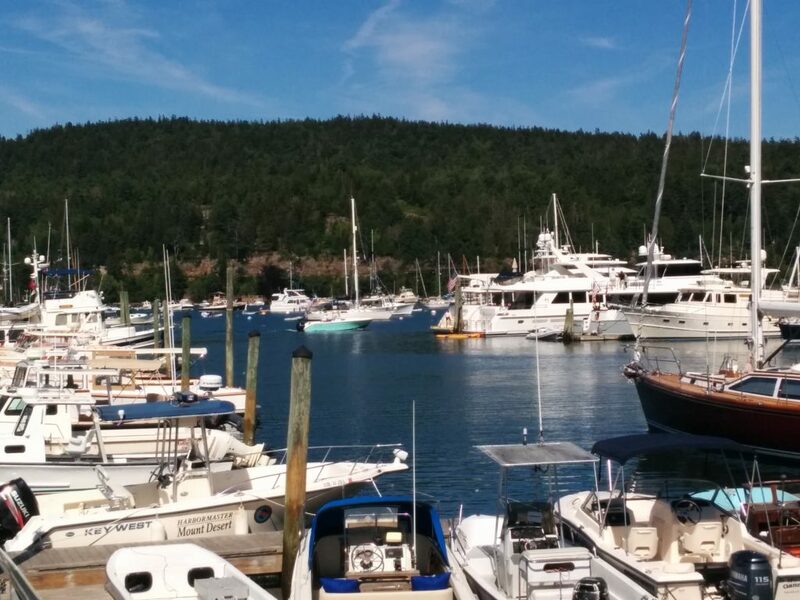 Southwest Harbor caters to more upscale boaters, as well. There are lots of beautiful, more remote locations, but services and access to the Island bus may be lacking. But wherever you end up in the mooring field, Northeast is a great base from which to grab the free bus to any destination on the island, and the shoreside facilities at the marina are nice. We’ll be staying here at least two nights. If you’re checking out the bridge cam videos, you’ll notice two interesting things in our transit to Northeast. First, as we left the main anchorage at Roque Island we passed a smaller anchorage, Bunker Cove, on our port (left) side. It was just about low tide. Due to the full moon, it was a “minus one foot” tide; in other words, one foot lower than normal. The sailboat in Bunker Cove was noticeably heeled over; the keel stuck in the mud. Oops. Second, after we arrived in Northeast Harbor, we spent a lot of time running up and down through the mooring field, looking for our assigned mooring, number 349. We found 348, 350, 351 and all the rest. In the end, there was no 349. We were ultimately assigned to 326W. But our tooling around the mooring field in time-lapse is somewhat comical. Last night we were treated to a nearly-full moon rise. The photo doesn’t do it justice; in person it was large, orange and it seemed you could almost see every crater! We decided to stay another night at Roque Island because, well… because we can. The sunrise was worth getting up early for. The beach was crowded today. At times there were probably 15 or 20 people on it. Although, since it’s almost a mile long, it still feels pretty secluded. Sammy made a friend named Harry. Harry was more interested in chasing sticks, something Sammy never seemed to get the idea to do. 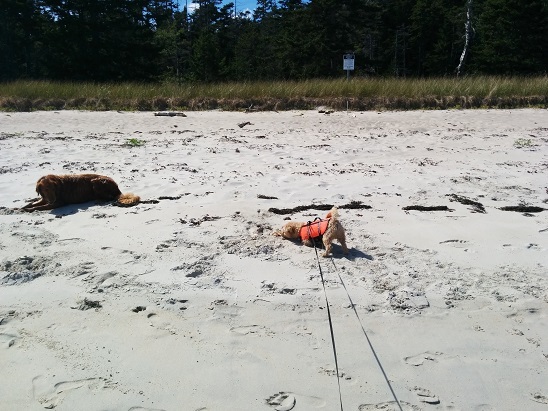 He spent his time running into the water, then rolling in the sand. It took a while before we’d let him back in the boat after that!